September 12 (MSE) Mongolian Stock Exchange organized 5 securities trading sessions and made transaction of MNT4.9 billion with daily average transaction of MNT24,690,324,793.00 in period between 05 September 2016 and 09 August 2016. 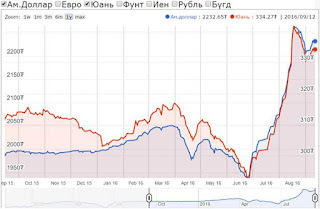 2,162,021.00 shares of 31 joint stock companies worth of MNT24,100,513,293.00 were traded. 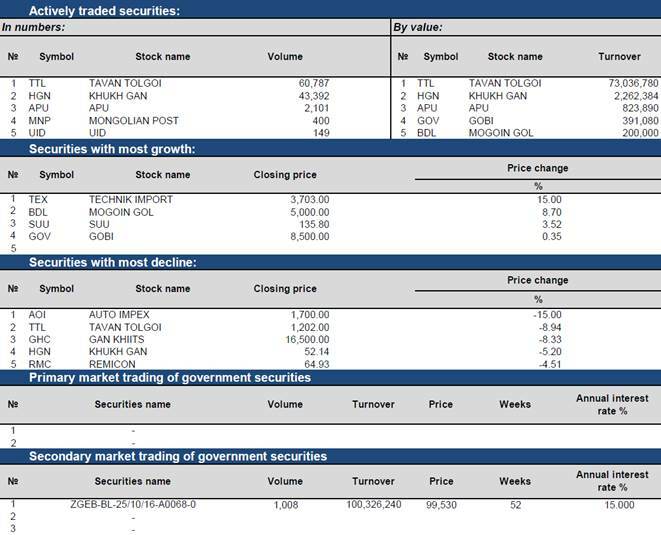 6,603 government retail bonds traded on secondary market of Government securities trading and total of 651,795,460.00 transaction has been made. As of 09 September 2016, market capitalization was MNT1,384,734,141,432.00 which indicated decreased of 0.99% and MSE ALL index reached 829.96 units which indicated decreased of 0.53% from the previous week. budget deficit of 1.81t tugrik ($826.3m), according to a release by the National Statistical Office. Mongolia Copper Concentrate Exports Top 1m Tons in Jan.-Aug.
September 12 (Bloomberg) -- Mongolia exported 1.1m tons of copper concentrate in Jan.-Aug compared with 930,000 tons in the same period a year earlier, for a 17.5% increase, the National Statistical Office says on its website. BoM Research Division, Tenkhleg Zuuch LLC. 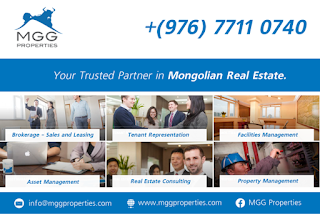 September 12 (Bank of Mongolia) Following is the public report of the August 2016 results of the "Housing Price Index" (HPI) research conducted independently by Tenkhleg Zuuch LLC at the request of Mongol Bank. The research shows that the general index of housing price was at 1.5 percent in August 2016. It shows no change compared to the previous month. The general index dropped by 3.8% compared to the starting period, and by 9.2% compared to the same month in previous year. Below are the Price index indicators classified by new and old houses. The new house price index was at 14.1 percent. This shows a decline by 0.7 percent compared to the previous month. The index dropped by 4.2% compared to an earlier period of this year, and by 7.1% compared to the same month in previous year. The old house price index was at 7.1 percent. This shows a decline by 0.07 percent compared to the previous month. The index dropped by 5.7% compared to the earlier period of this year, and by 11.9 % compared to the same month in previous year. HPI was calculated by applying Hedonic regression methods and the calculation was based on the information available for 4908 old and new houses supplied for sale at the real estate market of Ulaanbaatar for the particular month. September 12 (Bank of Mongolia) On 12th of September 2016, Financial Stability Council (FSC) has held its ordinary meeting at the Bank of Mongolia. During the meeting, the FSC discussed the draft of Monetary Policy Guidelines for 2017. In accordance with the decision of the meeting, FSC is planning to receive official proposal from the Ministry of Finance and the Financial Regulatory Commission on the draft of Monetary Policy Guidelines for 2017. September 12 (gogo.mn) General Police Authority held a press session today regarding the death of British paraglider Steve Nash, who had been killed and robbed in Mongolia on Jun 31st. Major B.Baatarkhuu noted "We got the news that British citizen Steve Nash was found dead at Arkhangai aimag on Sep 1st, 2016. In regards, a working group has established and now it is conducting an investigation. Currently, we caught two suspects in connection with the case". Unfortunately, his friend Gareth had experienced several heavy landings, which meant his back had been strained and he was unable to continue the expedition. Thus, Steve had decided to continue on his own and had been robbed and killed by assailants. They stolen his wallet and passport and left his paraglider - packed in his backpack. Ulaanbaatar, September 12 (MONTSAME) At the afternoon meeting of September 9, the State Great Khural (Parliament) held third reading of the draft amendments to the Bills on 2016 Government Budget and 2016 Human Development and Social Insurance Funds' Budgets. In the beginning, the head of the Standing Committee on Budget Ch.Khurelbaatar MP presented the conclusions. The standing committee backed the proposals, which set out the increase of state budget by MNT 3.9 billion, reduction of investment expenditure by MNT 65.0 billion and preserving the amounts of salaries, social care and benefits for public servants at the current level, as well as increase of operational expenses by MNT 61.6 billion in connection with the continuation of leather and hide sales benefits and the national scholarship programs. After commencing the fourth reading, the parliament members voted (94.4%) for adopting the bill on revising the government budget as a whole. With the expected increase in the Social Insurance Fund Revenue by MNT 530.4 million, the government budget deficit is reduced by MNT 51.0 billion, according to the Standing committee's conclusions. After the decisions, the parliament's irregular session ended. September 12 (news.mn) Over the last 16 years, a total of 4400 Mongolians have been born outside of Mongolia. This creates a problem because Mongolia does not allow dual citizenship. According to the current law, Mongolian citizens shall not be allowed to hold the citizenship of more than one foreign nation at the same time. However, Ts. Munkh-Orgil, Minister of Foreign Affairs said that the 'Mongolian Government intends to discuss a draft law on dual citizenship with quotas for improving national security'. A total of 2000 Mongolians, who were born abroad since 1998, actually have dual citizenship. Many of them live in the USA and Germany. Some 43 schools and Mongolian language and culture centers have been opened in 14 countries. With the exception of South Korea, many countries do not allow the transfer of social insurance payments to Mongolia. However, the Czech Republic, Germany, Poland and Hungary plan to allow transfer of social insurance payments to Mongolia. More than 30 thousand Mongolians study in abroad in countries including China, South Korea, the USA and Australia. Another statistic is that there are currently 130 thousand illegal Mongolian immigrants, 60 thousand of them living in South Korea. Ulaanbaatar, September 12 (MONTSAME) Twenty years have passed since Mongolia began marking the Day of Victims of Political Repression in 1996. On September 10, 2016, President Ts.Elbegdorj, Prime Minister J.Erdenebat and Speaker of the State Great Khural M.Enkhbold, along with the representatives of state agencies, armed forces, public organizations, civil societies, as well as the families and relatives of the politically repressed have laid wreaths to the Monument to the Victims of Political Repression. Leader of the NGO named "Children of Executed Victims of Political Repressions" and researcher D.Dashdavaa said: "The mass repression began with the false political charges against the generals of Mongolian militia, who took part in the liberation of Niislel Khuree (a former name of Ulaanbaatar), from July of 1921. Afterwards, 15 people in 1922 and 14 in 1924 were shot dead. The political repression has reached its peak between 1930 and 1940, having arrested 20% and executing 15% of the total male population. Such brutality has never occurred in any other country than Mongolia". There were about 40 thousand children left behind after their parents' arrest and seizure of property. Today, only fewer than 500 of them are alive and are all aged above 80. "Women have also been victimized during repression", said O.Tserennadmid, granddaughter of Jambyn Lkhumbe. Among the fallen female victims of repression were, the governor of a khoshuu (district) in Khentii province D.Dungarjid, the princess of Chinggis Khaan's "Golden Lineage" and second queen of Bogd Khaan N.Genenpil, and General G.Demid's wife B.Navchaa, she added. September 12 (gogo.mn) On the night shifting from Sep 23rd to Sep 24th, summer daylight saving time shift will end. September 12 (Mongolia Focus) A crushing defeat like the one that the DP suffered on June 29 should lead to some party-soul searching. More than two months after the election, I can only imagine that questions about the future of the DP, both, immediate as well as long-term are being asked. To me, this soul-searching will have to find the answers to a whole host of questions. The answers to five big questions will determine the party's future, I think. I am writing this not because I am in any close to or supportive of the DP in a partisan way, but because a functioning democracy needs a vibrant opposition. While the recent election was a positive surprise in terms of the turnout, and its clear result, the overwhelming majority that the MPP now holds and might be able to build on for next year's presidential election also holds some real risks. The DP has alway struggled with its internal divisions and factions. It seems to me that this is in part because it was originally founded around opposition against the then-MPRP, now-DP, not as a political movement in a particular ideological direction. To the extent that the main issue in the DP's platform is democracy, this has long been achieved in some ways in Mongolia, so it leaves the party without a unifying element. Sure, democracy requires continued work and vigilance, but it is no longer the main thrust of any kind of movement in Mongolia. The organizational origins in a number of different parties leaves the DP hamstrung as these parties, and sometimes more importantly, their leaders live on. The nature of Mongolian politics with its focus on patronage also represents a centrifugal force. This was clear in the past election when one of the great frustrations that voters seemed to feel was around the internal struggles within the DP that prevented some policies/policy mistakes during the DP-led government. It's not that the MPP or other parties are immune from internal struggles, but the DP does suffer more (publicly) from there, so some of the efforts in the coming four years should be directed at unifying the party. If party unity cannot be built either through strong leadership (see 2.) or through the development of a policy platform (see 4.) perhaps the DP and also Mongolia would be better off with a split into two or even three parties that do have a clearer profile and would thus contribute to a sharpening of political discourse in Mongolia around policy questions. One of the challenges to party unity has also been the continued leadership of the original democrats. Most of the more prominent DP politicians were involved in the democratic revolution of the early 1990s and very few younger or more recent politicians have come to the fore in the party. Most prominently, this holds for Elbegdorj. Independent of his qualities as a politicians and/or policy-maker, he has been very involved in national politics for 25 years now. But, despite this long record, it does not seem entirely like he's ready to leave politics yet even though his presidential term will run out next year and he is not allowed to run for president again (at least not next year). Of course, "Ebe" was young when he got involved in democratic politics, so he's still young now, at 53. One or two years ago, most of the speculation focused on Elbergdorj's likely ambition for some kind of international role, most likely with the UN. That's certainly something that I have been expecting for some time. It would fit very well with his desire to keep Mongolia (and himself) in the mind of the international community and with all of his initiatives on the international stage. Some time ago, it would've seemed that his chances at a UN position would have been good. The Secretary General route always seemed like a very remote chance, but head of a UN mission? Or head of some other international organization like the Community of Democracies? Those kind of positions would seem to suit him very well. It should also be noted that if he were appointed into some position like that, it would suit Mongolia well, as he will continue to give the country some prominence in international affairs. What are his chances? Who knows! There are so many political traps involved with many of those appointments that it's difficult to say in the abstract. But consider Mongolia's and thus Elbegdorj's credentials as democratic, somewhat neutral and certainly non-threatening, hopeful in terms of economic/social development (despite the current woes) and you'd have to guess that the opportunity for an international appointment does exist. The other subject of speculation is whether Elbegdorj will try to "do a Putin", i.e. promote a caretaker for himself to then run for office again at the next opportunity, i.e. the 2020 parliamentary or 2021 presidential election. His long-time chief of staff, Tsagaan, has been mentioned in this context. There was some plausibility to this speculation up until the election. Now, the DP's chances in the presidential election seem quite remote, so it seems unlikely that Elbegdorj would have a chance to "appoint" his successor. Next year's presidential election may be a moment when we will see some suggestions as to which direction the DP might turn. Until recently, Bat-Uul certainly would have seemed like an obvious candidate for the presidency. Another long-time democracy partisan his role as mayor of Ulaanbaatar has been quite prominent and despite some of the grumbles about corruption, etc., generally I thought he was perceived as a reasonably successful mayor. The election results in June belie this sense, of course, as the DP got thrown out of city politics just as much as they did out of the Ikh Khural. Did that kill Bat-Uul's chances at nomination? Perhaps, especially since they were already small due to his ambivalent role within the party. But who else? Enkhbold Z clearly harboured presidential ambitions and some of his politicking during the last two years of the DP government made it seem like he was angling for the party's nomination. But it never seemed like he was particularly popular as an individual. The direct election of the president does require some level of personal popularity. A younger candidate would obviously make a statement! But who? It does not seem like the DP or any of its faction or party leaders have really groomed a new generation of leaders. Yet, if the MPP nominates M Enkhbold – as seems very likely, see his staying aloof from the government despite his role as party leader – his lack of charisma and profile would seem to leave the door open for a younger/new candidate that could attract some of the voters who had been frustrated previously, but might not have intended to give the MPP full control of all politics for some years. I will continue this consideration of the future of the DP in a future post and will focus that on three more central questions, what about democratization?, what about policy?, what about corruption? and will consider other challenges to the future of the DP as well. September 12 (UB Post) The government formed by the Mongolian People's Party (MPP) has started going hard with the people rather than the billionaires born from the government. It is said that submissive horses are easy to ride. It seems like the government sees the people through the same lens. Instead of holding those who sank the country into spiraling debt while getting wealthy accountable, the MPP has begun a campaign to take down the middle class, which is only beginning to grow, and put the economy into an even deeper crisis by raising various taxes. The attitude and behavior of the MPP makes one wonder what changed when they changed the name of their political party. Only in a totalitarian society does the government does not allow people to own properties, and only then does the state centralize everything under its ownership, and ensure that everyone supports a single political party with all their heart. It is all done with extremely close supervision, and the great leader of the party has law enforcement agencies under his control only. In "1984", by George Orwell, these traits are clearly described. This kind of society still lives in the memories of many Mongolians. Mongolia's debt is twice its GDP, and has reached 23 billion USD, five billion of which belongs to the government. B.Choijilsuren, the Minister of Finance, reported that the government's debt was expected to be around 17.3 trillion MNT in 2016, but is now projected to reach 21.3 trillion MNT (equaling 78 percent of GDP) by the end of the year. The government is paying over one billion MNT just for interest payments, which is 20 percent of the state's actual budget revenue. The interest payments alone have increased 30-fold in the last four years. A month ago, the Minister of Finance also said, "The interest payments are expected to grow at a rapid rate going forward, because the previous government acquired loans to fund programs that were not included in the public budget. It has increased the debt pressure. Starting from next year, we will start paying back the bonds. However, there will be a lot of difficulties due to insufficient foreign reserves, the fall in commodity prices, Mongolia's lower credit rating, and an estimated budget deficit of one trillion MNT in 2016." The MPP and Democratic Party (DP) have led the country either on their own or together for the past 25 years. However, the outcome is an economy strangled by debt and a government sinking in corruption. Corruption is the reason why the government cannot estimate its public budget, keeps borrowing, devises projects that are only profitable for them, and spends without control. The MPP and DP shared the government in one half of the past four years. Prime Minister J.Erdenebat was the Minister of Finance during that time, therefore, he was most aware of where the economy was heading. Why didn't the MPP demand decisive action then? It is because nothing is more important to them than their political parties retaining seats in government. They have created a system in Mongolia where those who have power can retrieve and increase the vast amount of money spent on elections only when they are assigned senior positions in government. The MPP and DP spent 25 years to get the economy in debt and the government in corruption. Even though big crimes have been revealed and started a commotion, they have always gone AWOL after some time. This proves that those who hold power in both of these political parties are closely connected and are sharing a wallet. Since the MPP and DP have made the judicial system completely dependent on them, and are unable to hold each other accountable, their only means of sustaining their power and wealth is to make the people bear the consequences of the economic difficulties politicians have created. Any short term impact of a tax policy on the economy can be referred to as a "primary consequence", and a long term effect is a "secondary consequence". Politicians only look to the next elections and make short term decisions with primary consequences. Civil society – on the other hand – must always view issues over a longer term, take secondary consequences into account, and influence the government's decisions at the right time. This allows a democracy to have a balance through public governance and can prevent a crisis. In 2007, Mongol Bank purchased 20 tons of gold a year at global market rates. However, after the windfall tax of 68 percent was introduced, the bank started getting only two tons of gold annually. The rest of the gold started crossing the border illegally. Although tax income from gold sales saw a slight increase in the first year the policy was introduced, Mongolia lost 90 percent of the gold mined in the country. This is an example of the difference between primary and secondary consequences. The primary consequence of the government proposal to increase income taxes from 10 percent to 25 percent (which was later withdrawn) was to increase budget revenue. However, the income bracket they wanted to tax was 30 million MNT a year, which translates to 1,000 USD a month at today's rates. This is the salary our middle class is using to pay for mortgages and daily expenses. Imposing a 25 percent tax on those who have more income will force Mongolia's younger generation who were educated abroad, foreign experts, and foreign investment out of Mongolia. Visa interviews at the Embassy of the United States are now fully booked, and one has to wait 49 days to get an interview. Two months ago, it was only a seven-day wait. More positive long term impacts would come from higher taxes being imposed on all organizations and households, instead of only on apartments that have an area of more than 150 square meters. The proposal says that state-owned properties would be exempt from this tax. SHOULD WE GO BACK TO SOCIALISM TO GET OUT OF THE CRISIS? The key to overcoming a crisis is to reduce taxes instead of increasing them, and to give tax exemptions to companies that are creating jobs. It would also be a good long term step for state-owned companies that are privatized to allow people to buy their shares on the stock exchange, instead of imposing taxes on savings. In order to raise capital and pay back the government's loans, we need to make those who stole public funds pay. However, it has been made clear that the current political balance of power will not allow that to happen. In the bigger picture, Mongolia will never be able to completely get out of its crisis unless we get rid of corruption and strengthen our political and economic institutions. It looks like the MPP believes that the way to get our economy out of crisis is by eliminating freedom, where the government owns properties and the people do not. The MPP has just commanded Mongolians to march back to socialism. September 13 (Financial Times) Presiding over skinned sheep carcases in Ulan Bator's largest wholesale meat market, stall owner Gantulkhuur has become one small part in the debt binge rippling through Mongolia. She whips out a small ledger. Names and numbers in neat Cyrillic script crowd tighter and tighter on the pages, as her accounts have been taken over by retailers buying on credit. The retailers, for their part, are selling smaller cuts of mutton, Mongolia's staple food, or cheaper intestines and organs as their customers try to eke out their savings. "I used to sell all my meat in a day, but now I don't," she says. "People's buying power has decreased." Mongolia was a darling among emerging markets during the commodities boom. Foreign miners flocked to exploit the mineral wealth under its grasslands and deserts, pushing up growth in gross domestic product by 17 per cent in 2011. But after a debt-fuelled spending spree at the peak of the cycle, the landlocked country is now one of the worst hit by the downturn. Mongolia's efforts to extricate itself highlight the dangers of the "resource curse" — the notion that countries blessed with tremendous natural resources find themselves at the mercy of wealth-destroying boom-bust cycles. Success will allow the buffer state to continue balancing between China and Russia by attracting "third neighbour" allies like Japan or the US. Failure could upend that careful balance in China's favour, dragging Mongolia into its orbit just like Cambodia, Laos or some of the weaker Central Asian nations. In recent weeks the government has announced a trimmed budget and raised interest rates by 4.5 percentage points to staunch a weakening currency. International financial institutions are preparing to offer loans if Mongolia requests assistance to overcome a looming payments crunch next year. Meanwhile, Chinese creditors are making a case for greater investment concessions in an echo of complaints from western investors. Even if the fiscal crisis is navigated, individuals and businesses are struggling with debt at extortionate interest rates. Once known for their nomadic lifestyle, Mongolians have become a majority urban people, trading a culture of self-sufficiency for one in which nearly everyone owes money. An influx of mining cash helped create jobs and social welfare programmes that reduced the poverty rate to 22 per cent by 2014, from 39 per cent four years before, according to the World Bank. But living in cities also means paying for everything, from food to clothing to childcare, while jobs and cash handouts are drying up. Gantulkhuur says the switch from cash to credit accelerated last autumn as life got "a bit difficult". But then she pauses: "Is it OK to talk to you? I am worried I am shedding a bad light on Mongolia." Over the past month Mongolia's government has consolidated budgets and revealed to an alarmed public that, even with spending cuts, the budget deficit will reach 18 per cent of GDP, well above the statutory limit of 4 per cent, while government debt would reach 78 per cent of GDP, far above the 55 per cent target. The announcements led to a surge in purchases of dollars, which caused the tugrik to weaken precipitously, making it the world's worst-performing currency in August. That triggered a rise in rates to 15 per cent and restrictions on the amount of foreign currency that could be withdrawn in a day. Mongolia's total external debt is now estimated at $23.5bn, nearly twice its $12bn economy. Of that, government debt is about $8.4bn. Over the past year, "the situation has got a lot worse but it is an opportunity for us to reform our economy", says Zandanshatar Gombojav, a member of parliament who has spent his career in a number of financial posts for the ruling Mongolia People's party. Reform efforts consist of a mix of belt-tightening and promotion of new mining projects in the hope that the commodity cycle will soon recover. Hefty repayments begin in March, when a $580m bond issued by the Development Bank of Mongolia comes due. The country must repay $1.7bn-$1.8bn over the next two years, including a swap agreement with China's central bank. Mongolia has not formally requested assistance from the International Monetary Fund but it is expected to do so this autumn. Once it does, the Asian Development Bank, World Bank and Japan, its largest source of development aid, could chip in at interest rates of about 1 per cent, considerably less than its existing obligations. China's Asian Infrastructure Investment Bank might also lend to new projects, at rates of up to 2.5 per cent. Mongolia tapped the IMF in 2009 and paid off the $232m loan early thanks to strong prices for coal and copper, its main exports. This time around, public finances again depend on a recovery in commodity prices. The $5.3bn expansion of the Oyu Tolgoi copper and gold mine is expected to start producing significantly around 2021. But Ulan Bator will not gain dividends from the project for as long as 15 years, thanks to an arrangement whereby Rio Tinto finances its one-third share of the costs at Libor plus annual interest of 6.5 per cent. Neither the MPP nor the Democratic party, which lost in a landslide in July, could resist raising social spending commitments before every election over the past decade as politicians basked in the promise of windfall mining revenues. Many initiatives were kept off the official budget to avoid the 4 per cent deficit ceiling. Programmes included better salaries for civil servants and popular payouts like the monthly "child money" or student subsidies. Other loans were taken out to fund ambitious mining projects that never expanded as quickly as planned, leaving the payments extended over a longer period than anticipated. And then there were the international bonds, the most recent issued at 10.5 per cent. "No other country borrows at such high rates as Mongolia," one foreign banker said. "Other countries might be worse risks but they simply don't come into the market." Borrowing has transformed Mongolian life. Subsidised mortgages with a repayment rate of 8 per cent made apartments affordable for young middle-class couples and fed a property bubble on the back of the mining boom. Road projects to connect every aimag, or province, have opened the land to domestic and foreign tourists. Far-flung scenic spots are now accessible to car owners on overnight outings. There has been a proliferation of tiny tour agencies run by English-speaking Mongolians in possession of a Land Rover. One-off payments for roads and infrastructure IOUs make up a good portion of this year's budget deficit, potentially putting Mongolia on a relatively sounder footing of a deficit of about 12 per cent of GDP by next year. But the loans taken out by miners who were caught in the downturn or concessionaires who won the road tenders are causing concern. Many suspect that construction groups sought Chinese loans at lower rates of interest than are available in Mongolia. The tugrik's depreciation against the dollar and the renminbi will make those more difficult to repay. This is Mongolia's deepest collective fear. Conquerors of much of Eurasia 800 years ago, Mongolian territory has gradually diminished until the remnants were divided by the Soviets and the Chinese in the early 20th century. The country today consists of mountains, grassland and deserts as big as France and has been democratically governed since the 1990s after decades as a Soviet satellite. Most of its people are aware that 3m Mongolians cannot compete with China's 1.3bn citizens beyond the Gobi desert. These days, the desert is no barrier to indebtedness. The extent to which corporations — or the businessmen-turned-MPs that control them — are in debt to China is anyone's guess. In defending the tugrik the central bank has drawn down about Rmb11bn ($1.6bn) of a Rmb15bn swap agreement with the People's Bank of China, which was offered at 6.5 per cent interest. Mongolian politicians expect the swap to be extended when it expires in 2017. The Chinese have become impatient at delays and contractual changes on proposed mining, industrial and dam projects. Mongolian banks are lobbying hard to prevent the Bank of China from establishing a branch in Ulan Bator, ostensibly to serve the 7,000 small Chinese businesses in the country. Mongolian banks lend at annual rates of 22-28 per cent and private lenders offer about 36 per cent interest. By contrast, average Chinese corporate bank lending rates were 5.6 per cent in June and 10-20 per cent is common in the Chinese shadow banking market. Mongolian bankers fear Chinese businesses will gain a sudden advantage as borrowers quickly refinance at Chinese rates. That would pull the rug out from under local banks, increasing the economy's dependence on China. "They will swallow Mongolia," one businessman concluded gloomily. "In a few decades we'll be the autonomous region of Outer Mongolia." 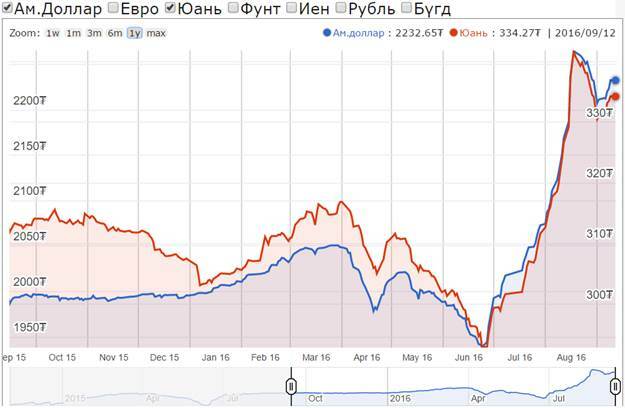 Already, Mongolia's private lenders have been burnt by the tugrik depreciation. Many borrowed overseas at cheaper rates to lend to car buyers, small businesses and distressed individuals in Mongolia. Some of that borrowing finances the pawnshops around Ulan Bator whose yellow signs advertise loans for televisions, phones and laptops. Some pawnshops had signs taped to the door advertising 14-day loans at 9 per cent interest. A woman working in a shop with better rates — 8 per cent over 30 days — said she has seen a steady flow of customers but the value of items has deteriorated over the past year. Zandanshatar, the MP, says many people have borrowed against their pensions and salaries through 2018. "That is another sign of the liquidity problem." Banks charge a punishing 18 per cent for borrowing against pensions, increasing the general indebtedness of the poor. The problem is acute in the ger districts, the sprawling settlements of migrants that have turned Ulan Bator into home for more than half Mongolia's population. The busy, ramshackle areas are barely supplied with power or water. Social subsidy programmes like the monthly payments of $9 for each child are a lifeline for many families. In a quiet restaurant decorated with striped green wallpaper and lace curtains, customers join in a lively discussion of the public finances as well as their own. Most see the two as linked, and worry about dependence on China. Erdenebayar, the restaurant owner, is "living from loan to loan", after an ill-timed decision to go into the business just as the commodity cycle turned. 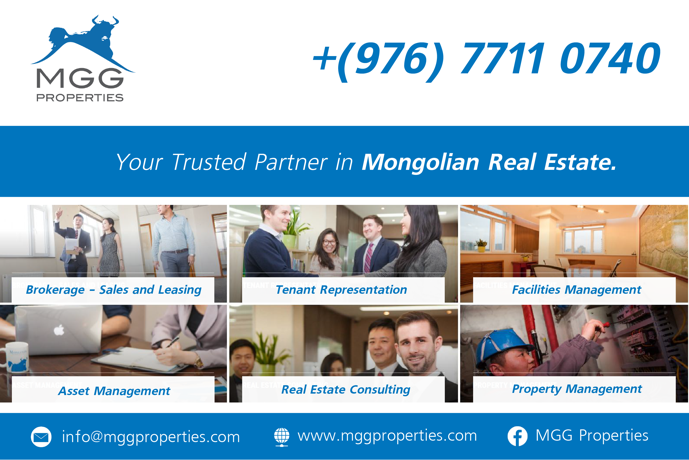 "Although Mongolians are working, we are in debt. We owe money to other countries," he says. "As a Mongolian, obviously I am concerned." Even Mongolia's nomads have been caught up in the country's debt problem. Loans have become an annual ritual on Mongolia's steppes, where herders capitalising on a growing market for cashmere are hostage to a downward cycle of falling margins and deteriorating pastures. In the spring, herders sell wool; in the autumn, meat. Sales go to pay off old loans and take new ones at rates that often exceed 20 per cent a year. The catch is the larger the herd, the easier it is to get bank loans but the larger herds also destroy the pastureland faster than new grasses can grow. The goats, which grow cashmere as an undercoat, are especially destructive. Cashmere is a cash crop and a useful export for Mongolia, what one tourist website refers to as "the nomad's ATM". But goats destroy pasture far more than camels, horses or cattle and the deterioration in the quality and variety of grasses forces herders to raise more animals to eke out more cash from the same land. The government says it is trying to encourage quality over quantity. But if every herder culls enough to restore the pastureland the crash in meat prices would eat away at their ability to pay off the banks. "Every herder has a loan. The more livestock you have the bigger the loan," says Batzorig, a 20-year-old, motorcycle-riding herder with a wide smile and 2m tugriks ($900) of debt, equivalent to about three months' wages in a city job. Batzorig and his younger brother have their mother to thank for cutting their dependence on the herding cycle. A few years ago, she trimmed the family animals from 1,000 to 600 and bought a house in a town. Y&R's Matthew Godfrey: "Mongolia really stands for something"
September 12 (gogo.mn) We interviewed with Matthew Godfrey, President of Y&R Asia which is one of the leading global marketing communications companies and has 188 offices in 92 countries around the world. We touched issues on success factors of Y&R, technology impact to the advertisement, factors for a successful social marketing and what makes Mongolian consumers different from others. Further, we discussed on BrandZ's first ever Spotlight on Mongolia report, exploring insights into the country's unique and progressive business environment, released by WPP and Y&R Mongolia on Sep 2th. Ulaanbaatar, September 12 (MONTSAME) Project on building an industrial park in Emeelt town was launched under the Resolution No 149 issued in 2014 by the Municipal Citizens' Representatives Khural. The park is also planned to have a residential area with housing apartments, service centers, and recreational parks. As of September, construction designs has been completed, informs the park authority. Completed documents include, the project's feasibility study, clarifications of general layouts, designs of piping and installations, heating, electricity, water supply, outside electric supplies, roads, flood dams, electrical substations, treatment plant and industrial ponds, hydrogeological survey, technical analyses and detailed environmental evaluations. Constructions of the park's treatment plant, drinking and technological water supplies, general electrical supply, P&I and roads within the park are expected to commence in 2017. LJUBLJANA, SLOVENIA, September 12, 2016 /EINPresswire.com/ -- Beenius, a provider of highly advanced Unified TV platform, and Mongolian company UNITEL Corporation LLC, leading provider of fix and mobile telecommunications services in Mongolia expanded their offer with new IPTV solution by Beenius. UNITEL couldn't found the common ground with the previous predominant middleware vendor, so they decided for Beenius and the Unified TV platform version 4.2. Beenius made successful migration to Beenius solution, integration of Edgeware for VOD and concluded the integration on Zyxel STBs which UNITEL customers are using today. Since Beenius engagement, Unitel has grown from challenger to main IPTV provider in the country. At UNITEL they leverage from Beenius advertising features which enables promotion of operator's and third party services and products. Since Unitel Corporation started working with Beenius, Unitel was able to increase Univision's ARPU by 5 percent. UNITEL recognizes that the competition in the IPTV segment is strong that's why their offer is enhanced with selection of best VODs. They offer the VOD selection in different variants – the same movie in different quality or audio language. With multiple movie variants the operator is able to charge differently for the different variants of the same movie. Furthermore most watch and recommended VOD feature brought customers relevant content on the push of the button that resulted in growth of VOD consumption that currently stands at three VOD purchases per subscriber per month. "That UNITEL made a right decision with the replacement was shown already at the beginning of cooperation when Beenius offered outstanding support, novel features such as Promotion Screen, T-Commerce and outstanding flexibility of the Unified TV Platform" said Mr. Ganbold Ravjin CEO at UNITEL. 'With Beenius Interactive TV Platform they are able not only to offer best TV experience to their viewers but also to facilitate high growth of their user base by monetizing Beenius advance features'' explains Filip Remškar, CEO at Beenius. Ulaanbaatar, September 12 (MONTSAME) In connection with an intended visit by the President of Mongolia to the Republic of Cuba, the Foreign Policy Adviser to the President, Mr A.Battor has shared his view on this historic visit, which is "the visit that has been on hold for 50 years". President Ts.Elbegdorj is paying the official visit on the way to New York for attending the 71st session of the United Nations General Assembly. Mr Battor views this visit as a good chance to revive the traditional ties with our old friend - Cuba. The heads of state of Mongolia and Cuba met in Moscow in 2015 during their attendance in the ceremony for the 70th anniversary of the victory of World War II. The Cuban leader invited the President of Mongolia to pay a visit to his country. Mr Raul Castro visited to the then- Republic of Mongolia in 1970. "Mongolia's reputation on international arena has been rising as the country hosted the latest 11th ASEM Summit at home with a success. Restoring bonds with Cuba will be an important milestone in Mongolia's foreign relations", he said. According to the visit program, the President is to have a meeting with the head of state of Cuba and is scheduled to give a lecture at the University of Havana. Thus, the President of Mongolia is becoming the only head of state to give lectures at the Universities of Cuba, North Korea and Myanmar, highlighted Mr Battor. September 11 (Philly.com) The Philadelphia Orchestra's growing relationship with the democratic government of Mongolia is set to intensify this month. In a prelude to the Philadelphia Orchestra's tour visit to the capital city of Ulaanbaatar in June 2017 announced earlier this year, the country's president Tsakhiagiin Elbegdorj will make a state visit to Philadelphia on Sept. 23. "Mongolia feels that it's time to make a strong cultural statement, and I want that to be with the Philadelphia Orchestra," said Allison Vulgamore, president and CEO of the orchestra, who issued the invitation to Elbegdorj. She credits several congressmen with making letters of introduction and doing other things to help facilitate the visit. She especially mentioned Rep. Brendan Boyle (D., Pa.) of the House Committee on Foreign Affairs. While such events are often about furthering mutual business interests, Vulgamore said the invitation "didn't come from a place of money. . . . It's a chance to know a quickly emerging country." The Mongolian president has been a periodic U.S. visitor as part of the United Nations General Assembly, where he'll be prior to Sept. 23. Philadelphia visits by such heads of state are uncommon, and even rarer is a state visit instigated by a cultural institution such as the Philadelphia Orchestra. "This visit marks a significant moment in cross-cultural affairs and demonstrates Philadelphia's role as a global destination," said Philadelphia Mayor Jim Kenney in a statement released by the orchestra. Vulgamore sees the event as building on last year's visit by Pope Francis and this year's Democratic National Convention. "It speaks well for Philadelphia being a hub of cultural exchange and advocacy for the Philadelphia Orchestra's work," said Vulgamore. "We're also seeing reciprocity. The China NCPA Orchestra played at the Kimmel Center. The Shanghai Philharmonic will be coming here. ... [For Mongolia] the next step is for us to play in their hall." An Aug. 29 letter from Secretary of State John Kerry to the orchestra's music director, Yannick Nézet-Séguin, said, "Your performance next year will exemplify the growing cultural and people-to-people ties between the United States and Mongolia. ... "
Most certainly, the president's visit should raise awareness of post-Soviet Mongolia. Although it is one of the most sparsely populated countries in the world (an estimated 3 million people in 603,900 square miles), its mining industries have been partly responsible for an annual economic growth of between eight and 11 percent in recent years. In contrast to the ups and downs of U.S. relations with China, Mongolia has proclaimed the United States to be its third neighbor (its literal neighbors being Russian and China). Elbegdorj champions causes such as environmental protection, women's rights and abolition of the death penalty. Born into a family of nomads (nomads still account for 30 percent of Mongolia's population), the 53-year-old Elbegdorj worked in a copper factory before being drafted into the army in 1982, when the country was still under Russian rule. He showed literary talent when writing for the army newspaper, and studied Soviet journalism at Lviv Polytechnic National University in Ukraine. Later, after the 1990 democratization Mongolia, Elbegdorj played a key role in a different kind of journalism, founding the country's first modern independent newspaper and television station. Elbegdorj went on to serve three terms as prime minister (1998, 2004, and 2006). After his first term, he came to the United States to study at the University of Colorado Boulder's Economic Institute and then Harvard University where he he earned a degree in public administration. But at this point, Vulgamore declines to look into the future: "We don't make any assumptions about that, but it's a wonderful idea ... to discuss after we pull off year one." September 12 (gogo.mn) The American Film Showcase (AFS) is taking place in Ulaanbaatar and Darkhan, Mongolia during Sep 12-17th. The American Film Showcase (AFS) brings award-winning contemporary American documentary and independent narrative films to audiences around the world, offering a view of American society and culture. Funded by the U.S. Department of State and administered by the University Of Southern California School Of Cinematic Arts in cooperation with the U.S. Embassy in Ulaanbaatar and Arts Council of Mongolia, the Showcase highlights the value of film in fostering understanding of American society and culture by bringing award-winning American films to global audiences. Through the exploration of diverse topics including disabilities, social justice, freedom of the press, and the environment, AFS aims to inspire cooperation, dialogue, and debate. The AFS in Mongolia consists of two primary components: delivery of targeted film classes and workshops for professionals and the organization of an AFS screening series free for the general public. Two film envoys will visit Mongolia as part of the AFS: Sandy McLeod, director of featured AFS film Seeds of Time, and director Andrew Garrison. In addition to the capacity-building and training component, AFS programming will include five film screenings at Tengis cinema. September 12 (South China Morning Post) The ambivalent relationship between Communist Party leader Mao Zedong and the man he picked to succeed him, Lin Biao, has led to a lot of speculation and conspiracy theories regarding the aircraft crash that claimed Lin's life 45 years ago. Some said it crashed in eastern Mongolia after being shot down by a land-to-air missile launched by either Chinese or Soviet forces, rather than running out of fuel, as claimed by Beijing in 1971. However, a report on the crash compiled by Mongolia's General Intelligence Agency, with help from Soviet military experts, suggests neither of those scenarios fitted the facts. The report, completed on November 20, 1971, more than two months after the crash, said Trident 1E airliner carrying Lin and eight others, including his wife and son, crashed due to "pilot error", not hostile fire. It said the plane's three engines were not damaged before the crash and that it had slammed into the ground at between 500 and 600km/h, with that explosion followed by a fire that burned for a "long time", suggesting there was plenty of fuel on board. Hong Kong-based publisher Bao Pu, from New Century Press, found a copy of the report, in Russian, in an American university collection early this year. "When we first obtained the documents from Harvard University's Fairbank Centre [for Chinese Studies] collection, I was very surprised that no scholars had done any serious analysis yet," he said. "I truly believe this document will shed new light on the Lin Biao incident, since it is the first known primary source document that is not official released by the Chinese Communist Party for the purpose of condemning Lin." Guangzhou-based scholar Yu Ruxin, who has studied Lin for four decades, arranged for the report to be translated into Chinese. The remains of Lin, a Red Army hero during the civil war who was named one of China's "10 Marshals" in 1955, and the others on the plane were buried in the Gobi Desert, close to the crash site, by Mongolian soldiers. "Beijing won't let Lin's remains go home, because they don't want to see any rites to commemorate him, which would reignite many people's aspiration to review Lin's case," Yu said. "That might trigger a new round of criticism on Maoism, which is still advocated by party leaders." September 12 (The Spectrum) In any given year, around 1,000 international students from about 100 countries around the world are studying at North Dakota State. I had the opportunity to sit down and chat with one of those students about her experience of coming to North Dakota from Mongolia. Arigun Ganbat (who goes by Amy) grew up in eastern Mongolia before attending high school in Ulaanbaatar, Mongolia's capital. "I grew up seeing movies and TV shows that were from the states, and so it was kind of a childhood dream to come here," Ganbat said of her desire to study in the U.S.
"Also, psychology isn't studied much in Mongolia," Ganbat noted. "I declared my psychology major while in high school, and there is only one university in Mongolia that offers psychology, so that was a big reason for coming here." Ganbat said she got used to living away from home when she went to school in Ulaanbaatar, but there were still some things about Mongolia she missed occasionally. "I miss some of the food, but the food here is really good, so it's easy to adjust to," Ganbat said with a laugh. "But I do miss family and friends — the people who really know you and understand you as more than just a student or a woman or an Asian girl." However, Ganbat has found Skype and other messaging systems useful in keeping up with people at home, "and people here are 'North Dakota nice,' so that helps," she said. "That was another nice part about coming here," Ganbat commented, "the expectations of what to be as a woman in Mongolia were pretty strict — you had to be thin, lighter skin was desirable, beauty was important — but here there is more emphasis on being yourself and on respect for different people." Ganbat was excited when she first arrived here, and so it was a surprise to her that some people were so nonchalant about classes. "I was always taken aback by people who didn't really care to go to their classes," she said. When asked about advice she would give to other students arriving from other countries, Ganbat shared some words that would be useful for any college student to consider. "If I could talk to my past self, I would say to be optimistic and be open to every experience that comes to you. Try to make the best out of all of it while you have the opportunity." September 12 (gogo.mn) "Morin khuur ensemble in the night temple museum" concert will be held on Sep 14th at 7PM at Choijin Lama Temple Museum. The temple museum has been promoting night visits to the museum since 2011 and each year the events are getting more interesting and attracting more visitors. Guests will enjoy a delightful evening at the ancient temple museum watching extraordinary Buddhist heritages, listening to Morin khuur performance of National Philharmonic and staying in the garden tasting snacks and wine. The temple museum will close at 12AM on this day. Ticket is available on sale at the museum cashier`s desk. Ticket price: 40,000 MNT. 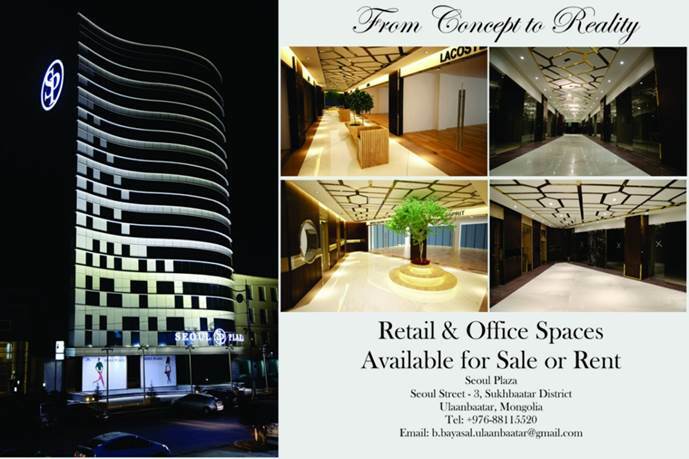 Contact for more info at: (976) 11 328547. Power lines kill up to 4000 falcons a year! September 12 (news.mn) According to observations conducted by the "Wild Animal Research and Protection" NGO, some 314 birds were found dead along a selected route of 56 km of 15 kW power lines in April. Nearly 61% or 191 of these dead birds were falcons. Mongolia has a total of 6000 km power lines, which suggests that up to 4000 falcons are annually electrocuted. There are 62 species falcons worldwide; nine species of which are to be found in Mongolia. September 12 (DOGO News) The Pallas's cat is a small-sized wild cat species that lives in the remote steppes and mountains of Central Asia. Excessive hunting of the cats that are coveted for their thick, lush, fur as well the loss of habitat has greatly reduced their numbers in the wild. As a result, the beautiful animals have been on IUCN's near-threatened list of species since 2002. It is, therefore, no wonder that the recent sighting of the elusive felines in the mountains of Mongolia is causing such joy among conservationists and cat lovers worldwide. September 9 (news.mn) Judo competitions at the 2016 Rio Paralympic Games are taking place from September 7th-18th. Unfortunately, Mongolian judoka A.Munkhbat has lost the chance to compete in the men's 66kg category, because he weighted above the limits on 8thSeptember. Before the competition his weight was 65.9 kg; but on the day of the competition A.Munkhbat's weight had risen to 70.8 kg. According to the rules, he simply will not be allowed to compete if he weighs above or below the limits (in kilograms) fixed for the division. Each day, two weight classes will be contested - one men's division, one women's division. All rounds of the competition within a given weight class take place on that day. Eight Mongolian athletes are participating in the Rio-Paralympics, two of them judokas. September 12 (news.mn) Top sumo wrestler, M.Davaajargal, better known as "Hakuho" will skip Aki Basho in Japan, which is a major professional event of the sport. The all-time sumo record holder will not be competing due to an injury of his right big toe sustained during a July followed by an injury to his left knee which worsened when he competed in a tournament in August. "I'm sorry to all my fans," Hakuho said. "I want to work on getting fit in time for the autumn regional tour and the Kyushu Basho (in November)." This is the fourth time that Hakuho is missing all or part of a tournament and the first since last year's Autumn Basho, when he withdrew on the third day. It will be the first time he misses an entire tournament since the 2006 Kyushu tourney, when he was an Ozeki. The 2016 autumn tournament will start on September 11th in Tokyo. September 12 (news.mn) United World Wrestling (UWW) has recently released the 2016 World Freestyle rankings with Rio-Olympics medalists. Among the top 10 rankings, Mongolian State Honored Athlete G.Mandakhnaran has been listed 5th in the men's category in the World Freestyle rankings. Also Mongolian wrestler P.Orkhon has been ranked 7th in the women's category. In total, six Mongolian wrestlers have been listed in the top 20 rankings in the 5 different weight categories. The "Final" 2016 world rankings for the six non-Olympic weight categories, including 61kg and 70kg in freestyle, will be decided at the world championships for categories not contested at Rio 2016. The championships are scheduled to be held on December 10th -11th in Budapest. September 13 (Saipan Tribune) The CNMI U14 Boys National Team won the only award given in the AFC U14 Regional (East) Festival of Football 2016 held at the Xianghe National Football Training Center in Beijing, China last week. The Commonwealth crew brought home the Fair Play Award for showing exceptional sportsmanship in the four games they played in Group B of the event. "The Team deserved it because of the sportsmanship and respect they showed to the other teams, referees, and AFC officials. No other award was given in the festival. The CNMI was the only team with no cards during the festival," said coach Jershwin Angeles, who returned to Saipan with the rest of the Commonwealth delegation early yesterday morning. The CNMI squad was composed of Michael Rojas, Sebastien Manabat, Mark Salamat, Kirt Andon, Ichiro Borja, Terrence Montenegro, John Guiller Canape, Jamin Elliot, Edward Cho, Mark Esalan, Joshua Waldon, Brandon Delos Reyes, Christian Aldan, Kirro Batino, Thomas Benavente, John Paul Cruz, Joshua Mendez, and Eun Syu Hahn. Wai Wo Lee was the assistant coach, while NMIFA technical director and CNMI Men's National Coach Kiyoshi Sekiguchi served as head of the delegation. "Congratulations to our team and officials. This (award) shows that our boys are good representatives of the CNMI. Thank you coaches for training and teaching them well," NMIFA general secretary Ross Zapanta said in a message sent to Angeles. Other supporters of the team also expressed their appreciation for the Teen Ayuyus, who may have not won a single match in the festival, but earned the admiration of the other participating squads and the organizers for showing respect for the game and their opponents. "Way to go U14 NT and officials! So proud of you for being the great CNMI ambassadors and working so hard against strong opponents," NMIFA vice president Vickie Izuka said through an email sent to Angeles. The Teen Ayuyus first played Guam and forced a 2-2 draw before bowing to Japan, 0-17. The CNMI bets were also shut down by another powerhouse team—South Korea—0-14, but closed out their assignment by scoring two more goals in a loss to Mongolia, 2-7. "There are still big differences between the CNMI and Korea: size, strength, power, skills and speed. But I believe the boys learned a lot from this game, especially the first timers," the CNMI coach said. For their last game, Angeles said the Teen Ayuyus hung tough in the first half and were aggressive both on offense and defense. "The first half was 3-2. From a corner kick, the ball dropped in front of Sebastien and he just kicked it in to make our first goal. Kirt scored from a 30-yard free kick, it was low and to the left bottom of the goal. Mongolia's wall was in off position so Kirt took advantage and the Mongolia GK was not able to do anything," he said. "Most of the boys cried after the game, the Mongolian players hugged and cheered them up. It was a great moment for both teams. I believe the boys cried because they gave everything for this game but not enough to win it. We still made history today (last Saturday) by scoring two goals against Mongolia," Angeles added.